Middlesbrough residents have been taking part in fun workshops to tell their stories about the town. We asked them to give their honest views, and because not everyone has the same opinion, we need to let you know that the views expressed on this page are only those of our participants, not the Council. Could I be more loved than I know? 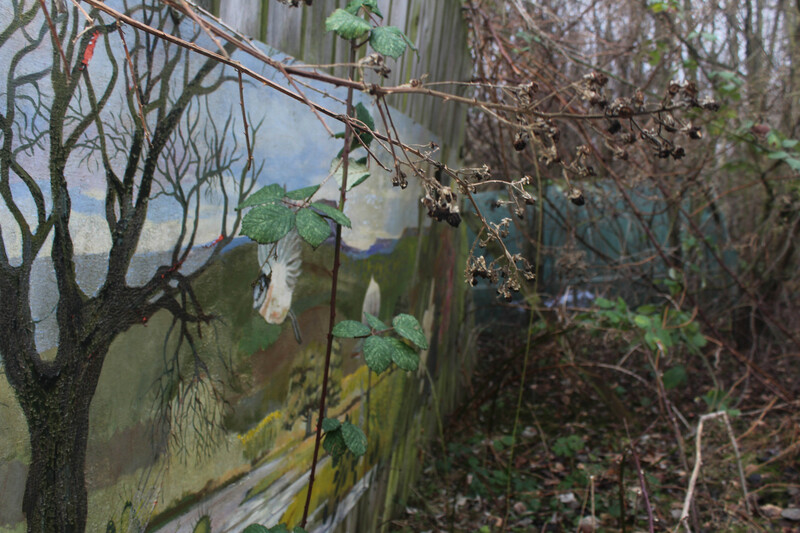 When I first heard the name Hemlington Lake it invoked dark images of a small lake in a hollow surrounded by ancient woodland and mysterious derelict buildings. To begin with I had no idea where or what Hemlington Lake was; I was pleasantly surprised when I eventually got around to visiting. Now it is a place that I regularly visit. I park close by and within a minute I am looking over the expanse of water and the bird life that is supported by the lake. This day was particularly quiet; it was mid-week and mid-term. My springer spaniel Sally, age twelve and curious, was with me. Sally took several tentative steps toward the bank of the lake. I was looking through my binoculars; the small island had several birds roosting but there was no movement. I took up my camera with the idea of shooting some random pictures and looking at them later at home on my computer. To my left I noticed movement. 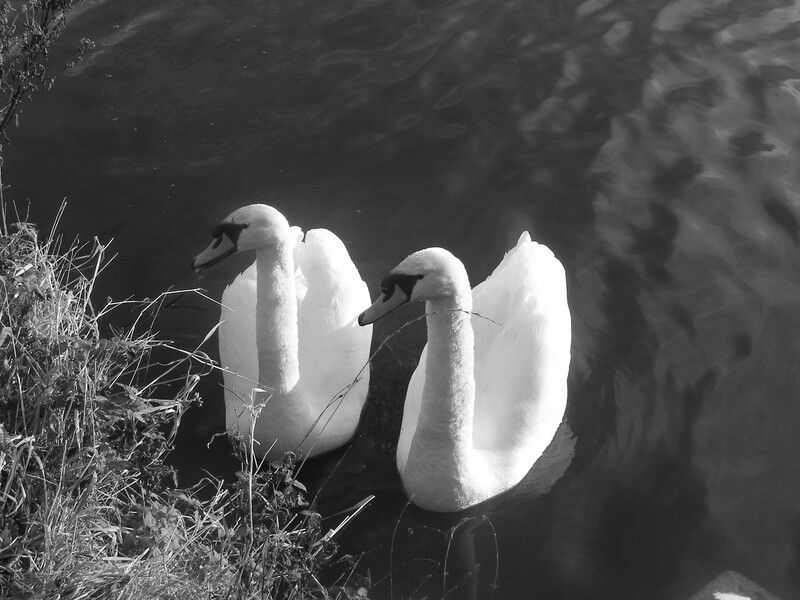 Two swans approached majestically; they cut through the surface of the lake with hardly a ripple. They certainly had my attention and I looked on, fixated by their beauty and elegance. Sally was rooted to her spot as a small flotilla of mallards, coots, moorhens, and other species of water fowl followed the swans. They seemed to glide to a halt only feet from the jetty on which I stood. As they drew to a stop they began to hiss. I thought perhaps they were after an easy meal until I noticed they had turned their attention to Sally. The turn of the heads seemed to have been perfectly choreographed as the hissing got louder and more intense. Sally looked at me as if she was thinking “what’s up with them two”? With no food forthcoming, the swans moved gracefully away; the flotilla of other birds came close expecting a free feed. The ducks and coots retreated to the middle of the lake, each one taking its turn to dip below the surface looking for food. It is said that these graceful creatures are evolved from dinosaurs. I wonder if man will ever evolve to live in harmony as these graceful creatures have? I stood listening to the various sounds that began to fill the air. The hissing swans must have stirred the tranquillity of the island; some birds took to the sky in fear of predators. It then dawned on me that theses birds seemed to understand each-other’s warning calls. It was not long before the surface of the lake was stirred into a frenzied cauldron of birds taking to the sky. The swans remained unflustered as they headed to their next port of call somewhere around the lake. I waited until the various species returned and settled down to the peace and quiet of their home. I now always take time to pause my walk with Sally to look around at the life that occupies our diminishing hedgerows and woodland. 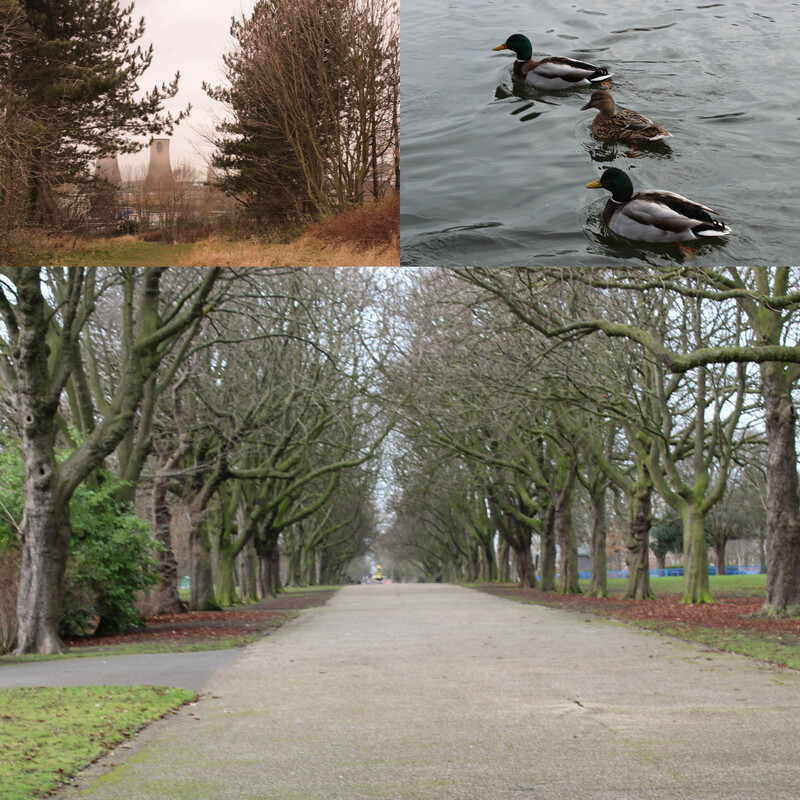 Middlesbrough has some beautiful walks that help wildlife thrive. Take a camera and enjoy them. Not in this stand so bare and frayed away. Of blue, yellow, red and green. Taking photos of the wall patterns. With a small link to an old past. 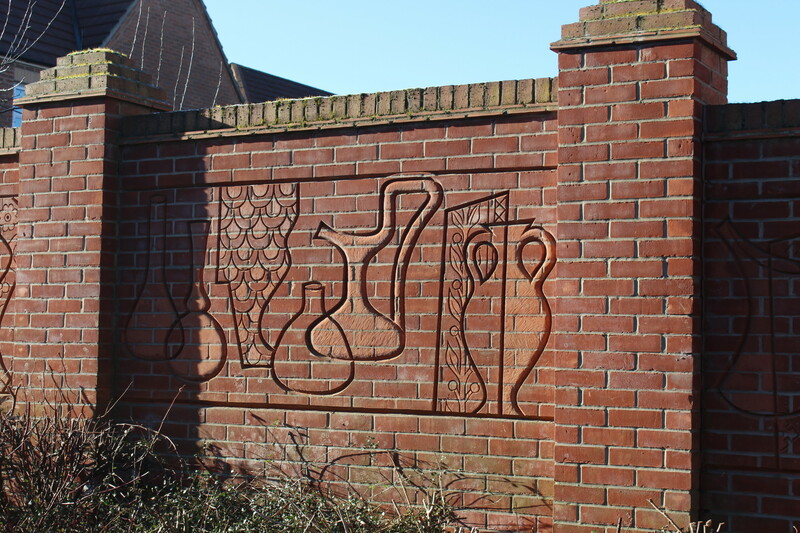 Where pottery was once produced. Before I came to capture an image? To the wall’s commemorative event. But what of the pottery workers? Working on the slip or glazing? And yet, the legacy always survives. To locals with busy hands. And yet, colours never fade. From the period of 1887-1932 the suspect is reported to have killed between 150-500 people. His preferred method was to hold them down by placing all of his weight on the victim’s chest and covering their nose and mouth with his beard until they suffocated. He would then leave and wait for the body to be found. For years the police had no idea who was committing these crimes as the suspect would pose as an inanimate object. The suspect was finally apprehended after being seen killing his last by a witness. After the police were informed of the crimes they arrested the suspect. 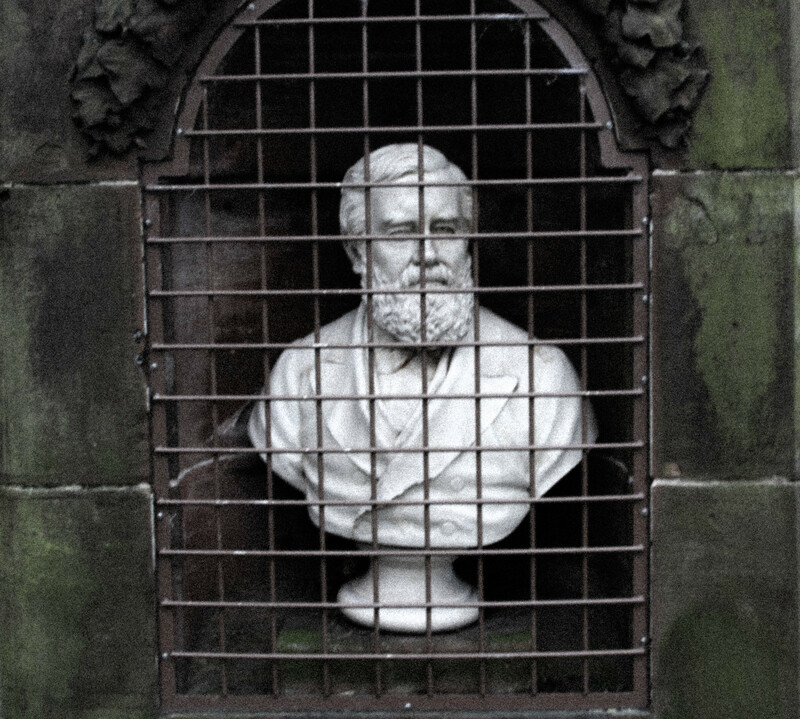 He was then sealed in an iron cage in the park where he killed his victims. It was deemed that it would not be appropriate to place the suspect in a normal jail due to its supernatural nature. I had left the house without my parents’ knowledge, to meet with my lover in secret, when I saw the murder. A tall man in a long coat and a bowler hat walking along one of the nearby paths. I knew he was a business associate of my father so I hid to ensure he would not find out about my sneaking out. I then saw a statue fall on him. I was about to revel myself and rush over to help him and make up an excuse for my presence when I saw the statue move. It slowly began moving up his body towards his head. When the statue reached his face it lent forward and forced its beard down the throat of the man until he stopped moving. I froze and watched the statue move back into place. The police arrived a few hours later and I told them what happened, but they didn’t believe me until the statue moved again and tried to murder one of the police men. The other police men pulled the statue off the attacked man and arrested it. What attracted me to this grave stone was the design engraved on it and also the good condition that it is in considering it has no shelter from the elements that it has been exposed to for over more than a century; other stones in the area that are about the same age or less have eroded a lot more than this one and you can hardly see the inscriptions on most of them. At the time the photo was taken the weather was dry and bright; in the photo there is a tree standing further back with its branches like bony fingers reaching out to take hold of the stone. Was the area it stands in chosen by the person who had it erected? Had they chosen the site because it was so bright and the sun shone on the people laid there? Who I wonder did erect it? Could it have been Susannah the widow of Frederick Hiser, and, if it was, who put Susannah’s name on the bottom when she died? 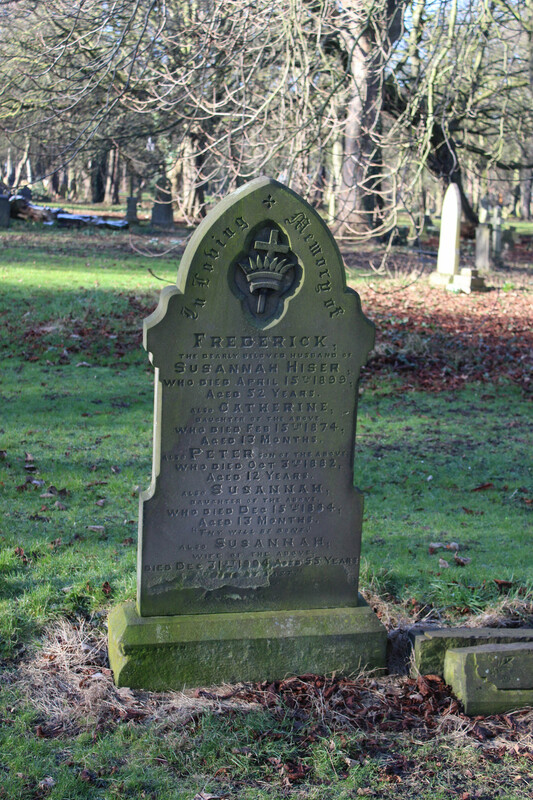 Frederick died aged fifty two on the 15th of April 1899. Did Susannah choose the way the stone was worded and also the elaborate cross and crown design which I think is the Salvation Army emblem? Or did the Salvation Army pay for the stone and engraving because Frederick was a salvation minister? Did they look after Susannah after her husband’s death? Is that why their children – Catherine aged 13 months died first in 1874 Peter aged12 died in1882 and Susannah junior who died coincidently age 13 months in 1884 – had their names added below their father’s? These deaths show how low the mortality age was in those days. 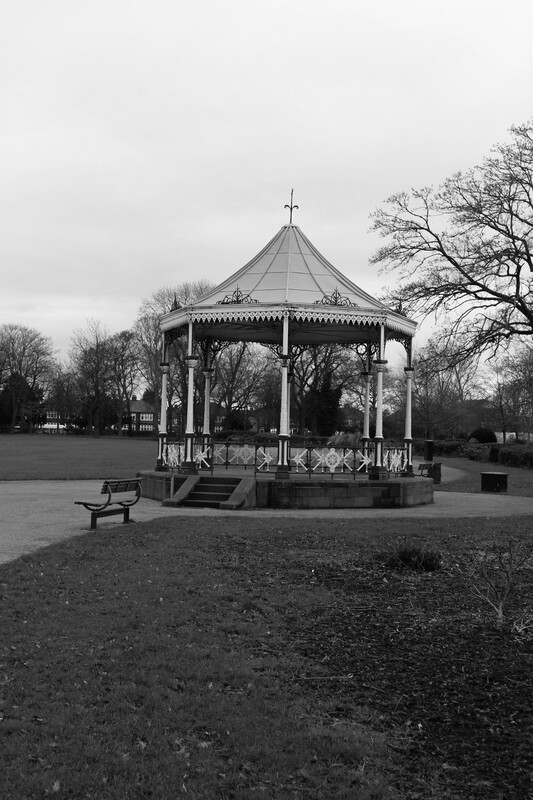 Frederick may have been a manual worker, in which case he would probably be unable to look after his family through ill health brought on by the heavy type of work being done in Middlesbrough at that time. Also the pollution in the town; most houses were very close to the works. Some houses were actually inside the works, so is this why Frederick died? Did Susannah and Frederick have other children who survived them both? Was it they who put up the stone? We can only guess about what went on in Susannah’s thoughts after losing her children and then her husband… how did she survive? There was no welfare state then; did she take up work or was she too frail to do work and did she depend on the parish for help or did she remarry and her second husband paid for the stone then added her name to it after she died? There is some lettering at the very foot of the stone but it is too hard to make it out clearly – could it be Susannah’s second husband’s name or is it the stone mason’s name? We can only guess at this but one thing that is definite is that there are so many unanswered questions about this stone and others in this cemetery, and the only people to answer them have gone. The terrifying Triceratops was spray painted to an inch of its life, with midnight blue writing shaped around its body. Its nose was a dirty blue colour and poorly shaped. The dinosaur had been drawn on a lot and had been tagged by the graffiti artist. 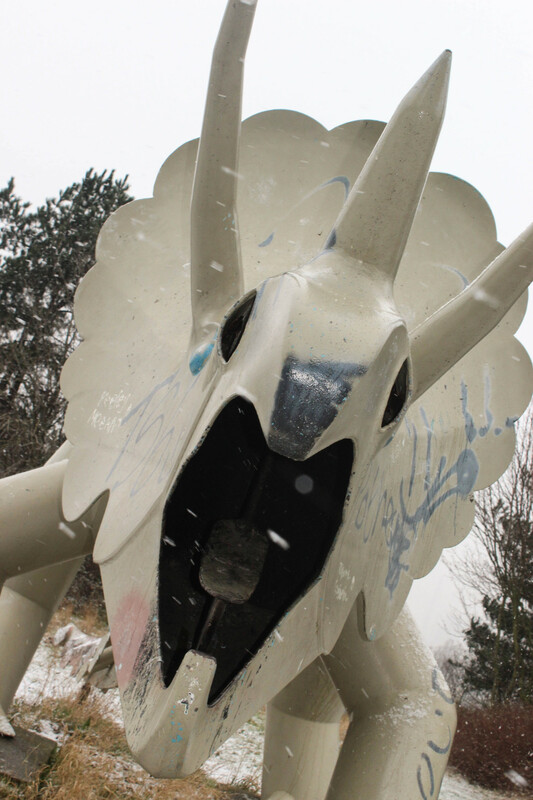 When it was raining, you could hear the raining pinging on the dinosaur. The wild wind was howling through the dinosaur’s mouth. In the background, there were skeleton-like trees, reaching their limbs out through the snow. The clouds darkened the sky; it was hard to see. The icy wind stabbed my face as I walked through the forest. 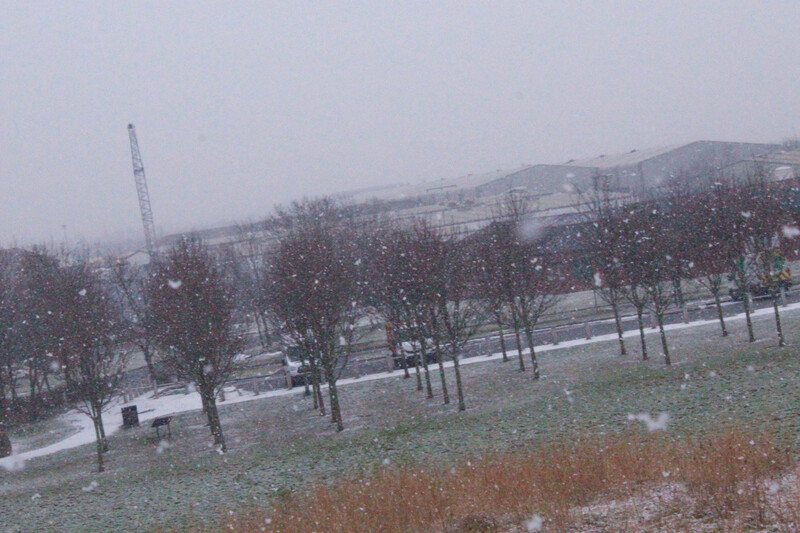 It sounded like someone was following me but it was the light crunch of the snow on my feet. White little feathers fell, catching on my eyelashes, tickling my eyes. My once nice straightened hair was now a tangled mess. The white forest was calm, the only sound made was the wind howling through the bare naked trees. The once green leaves were now a frozen, crunchy bundle on the floor. I kept walking when I reached a bridge. There were glittering icicles hanging from the frost decorated rails. The clear river was flowing so slow it was almost completely still. I finally reached the end, to where I was, at my front door. Albert Park is a small oasis within a busy industrial town. Nature and industry can live side by side, all we have we to do is encourage nature to stay. Albert Park has an avenue of trees which line the main path. Halfway along the path is a fountain, carry on walking down the avenue and you will come to some steps. Walk down the steps and look at the lake and wild life. Take the time to sit and relax in a busy world. 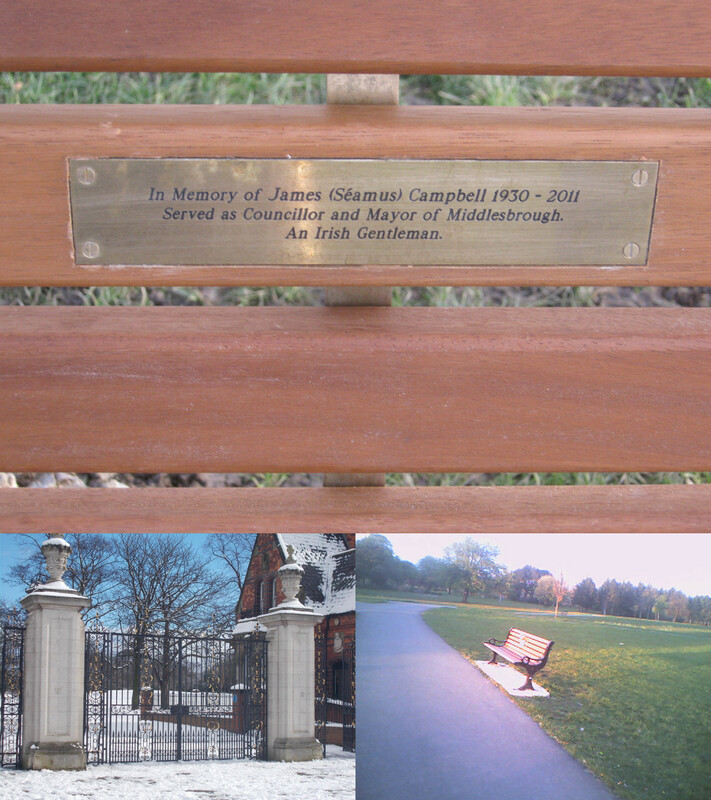 On 20th March 2011 a loving, caring, tie-smart comical man, Seamus/Jim Campbell sadly passed away at a good old age of eighty years in James Cook Hospital, Middlesbrough. Sadly leaving friends and family but also a legacy of achievements for his town. I would like to take this opportunity to introduce you to him, who he was and how he helped to make Middlesbrough a better town. I would like to introduce you to an Irish gentleman – my Dad. Our dad was born into an Irish farming family in Lisnakelly, Carrickmacross, County Monaghan and had two siblings, a brother Tony and a sister Mary, whom he cared for, being the eldest, after the early deaths of their parents. Always an ambitious man, in 1951 he sailed over to England looking for work. 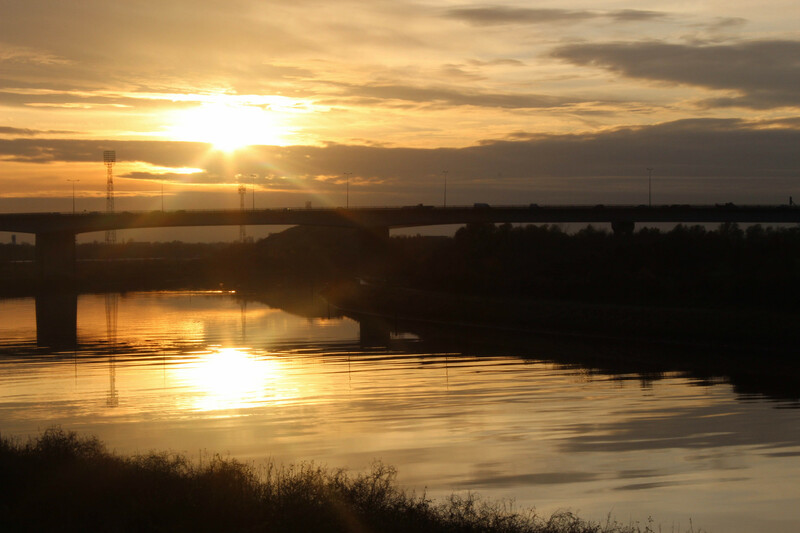 He chose to come to Middlesbrough where employment was ripe. Dad gained employment with Dorman Long and worked for them until he returned to Ireland in 1955 where he met and married a beautiful lady, Mena Lowe – our mam. A year later our mam and dad together with their first daughter Mary left Ireland for good and sailed back to England. They settled in Middlesbrough where Dad picked up his old position in the steel works. He then later moved on to new employment becoming a process worker at ICI Billingham in the 1970s. Dad had many hobbies during his life and was a very active man whilst being a loving husband and father to five children. He did a lot of volunteering work in Middlesbrough. He learned First Aid and went on to become a trained St John Ambulance officer. One of his duties was to attend Middlesbrough FC matches – he was a devoted fan. He was always ready to attend any crowd injuries or run onto the pitch as the sponge man or stretcher bearer. The late Queen Mother presented him with the brigade’s highest honour ‘Order of Serving Brother’. He also devoted time to running the Middlesbrough Irish Centre, providing support for Irish residents of the town. Our dad was first elected as a councillor in 1973 for the Thorntree ward until 1985 when he took early retirement from his job as a control room supervisor for Northern Gas. He was then elected Deputy Mayor and then Mayor of Middlesbrough in 1986. His door was always open to the residents of Thorntree and Park End. As Middlesbrough Mayor it was Dad who welcomed the players and new board of Middlesbrough FC to the Mayor’s Parlour for the announcement that the club had been saved from liquidation. During this time our dad was the chairman of the Environmental Health Committee and I remember him saying that he regarded this as his greatest achievement, by helping to clean the town’s air. After our dad’s passing his former colleagues described him as diligent and hardworking, with a great sense of justice. A man who wouldn’t rest until he had done everything possible to represent his constituents’ rights. My dad was an exceptional role model to me and I am personally proud to say that I have taken after him in several of his traits. I will always miss him and love him. He had a brilliant character and sense of humour and was a very fair man. Our Dad was an Irish Gentleman. as the stage is set on Centre Square. with red and white. 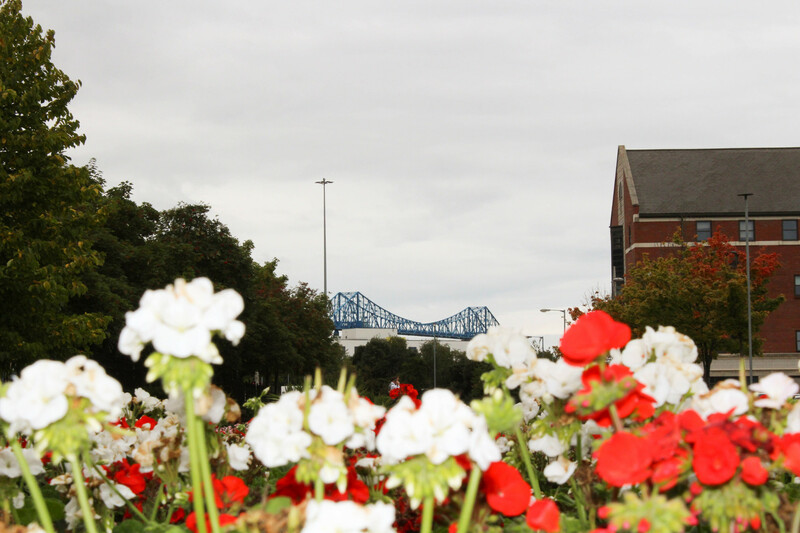 The colours of Middlesbrough. Saturday afternoons tramping on through. in check. Keeping them on their toes. of colour blending into one another. of blue string hanging, always knotted together. through the cracks of cloud. How far have they walked? From down the road and the other side of the world. the pavement edges, on their way out of town. there in the marks they leave behind. in a circle, we share something of ourselves. toasted marshmallows sugar the air. 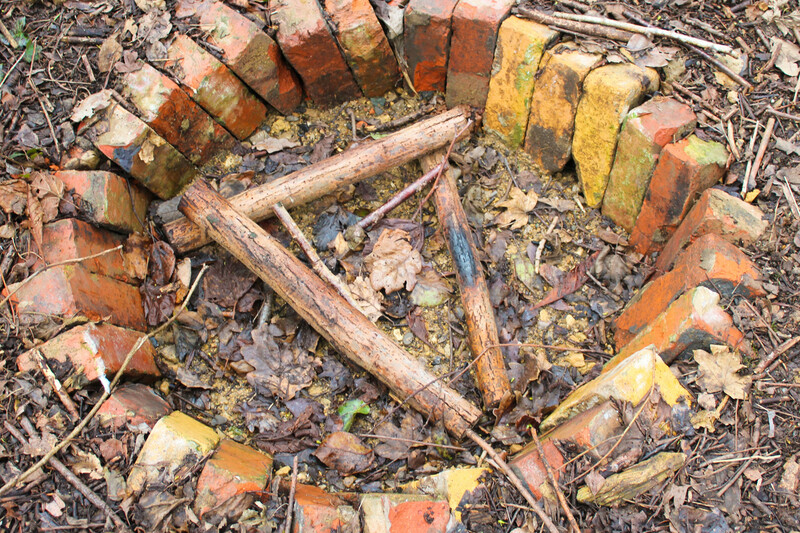 Dry sticks placed so neatly in a triangle. and stay burning, keeping our bodies warm. Views expressed on this page are the views of the individual authors only. They in no way represent the views of Middlesbrough Council or the Arts Council.